There are many answers to the question how to start running, but here is perhaps one of the easiest and most basic approaches to get you started. The key point to remember is to start slowly with a continued progressionand build up in both the amount of time you can run for and the speed that you can run at. The old saying ‘don’t run before you can walk’ is certainly true here. I always say if you start off running by going all out right from the start, then how are you going to be able to progress. All exercise has to get more challenging as you go along to be effective, but it should always begin from a comfortable starting point, not from a maximum all out effort. If you begin at the limit of your abilities, you only have one way to go – backwards. However if you start from way below your maximum, you can coax and encourage your fitness to improve as your body gets used the action of running and the increased exertion levels. Select a circular route that will take you around 30 minutes to walk comfortably in its entirety. Begin your session by walking leisurely for about 5 minutes. Ideally this should be on flat terrain and feel comfortable to do. Next, do a selection of running specific stretches, you can find out more about which stretches you should do before and after running and exactly how to do them in ‘How to Start Running’ – a complete program based on running for beginners. These stretches will only take you approximately 2-3 minutes and will help to lengthen the muscle fibres and loosen up the joints a little. To start the main section of your workout, you’re going to begin walking again, but this time with a purpose. Striding out, using your arms and working much harder than before. Imagine you’re in a rush to get somewhere. The next stage is to have a go at running. If you’re very much out of shape, then you’ll need to just run for a few moments without any structure at all. I would suggest simply using short bursts of very slow running followed by a gentle walk until your breathing and heart rate has lowered and you feel capable of going again. Repeat this process throughout the entire session. If you’re able to run, albeit very slowly for a minute or so without stopping, then use this second approach. For this you’ll run for one minute and then walk for 5 minutes. When you revert back to walking again, begin very slowly to get your breathe back and allow the muscles to recover, before building up your speed to walking briskly by the end of the 5 minutes. If you feel that you can't manage a full minute, then try just a 30 second spell of running instead. The next time you go out, repeat your first session exactly. On your next training session after that, use the same route again but this time try to increase the time you run for by another 30 seconds. So in session 3 you're running for 1 minute 30 seconds and walking for 4 minutes 30 seconds. Again repeat this session the next time you train and then on session 5 increase your run by another 30 seconds and reduce your walk by the same. This means you'll be running for 2 minutes and walking for 4 minutes. Continue using this same principle until you can run the entire session, then you can start to increase the distance you run for or the speed you run at, depending on your running goal. 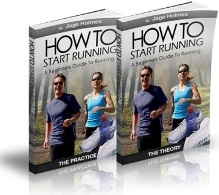 If you'd like to find out more about how to start running and discover more training techniques you can use to help you to become a good runner fast, lose weight and improve your fitness levels quickly, you can find out more here – How To Start Running.